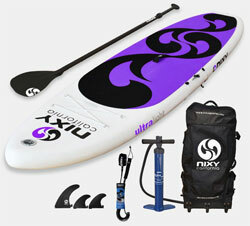 The NIXY inflatable paddleboard is a product of NIXY Sports, a Californian based company. It is a family business that has been building water sports equipment for a while now. Since they are a family of water sports enthusiasts, they only manufacture equipment that they themselves would love to use. Therefore, you can trust the NIXY Venice Yoga SUP because it was made by paddlers who know the needs of fellow paddle board enthusiasts. 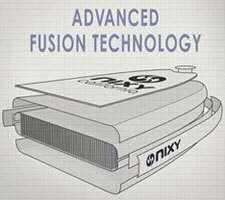 NIXY Sports say that the Venice is high quality, light, affordable and easy to use. 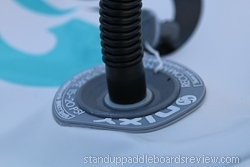 In this article, I am going to review this SUP board in detail to show you whether or not it does what NIXY Sports say it does. A backpack: the bag has three sturdy wheels for ease while traveling with the board. You can also carry the bag as a backpack. The waist strap and shoulder straps are padded and adjustable, making it quiet comfortable to carry the board over longer distances. The size of the bag is perfect; after putting in the board, pump, paddle and leash I still had space for a few other accessories. A pump: it is a Bravo 4D high-pressure pump that will inflate your SUP in a very short time. Although an electric pump is still the more comfortable, the Venice is easy to inflate. A Paddle: aluminum paddles tend to be a bit heavier, but all things considered, I found that I really liked this paddle with its curved blade. It has three pieces and you can adjust it from 67” to 82” (170 cm to 210 cm) by loosening the clamp and clicking it in the desired position. The three pieces also make it very easy to store. Three removable fins: these three fins give the board straight traction through the water, and can be attached to the board before or after you pump the board. Just hook the end of the fin in the bracket and tighten the screw. You can either do this by hand or use a screwdriver/coin. A leash: the NIXY hybrid leash is 10’ long with stainless steel double swivels. Repair kit: I doubt that you will ever need this kit, given the quality of the board. But if you ever do, NIXY Sports have got you covered. The Bravo 4D is a single and double action pump, with a dual-to-single switch lever. It has an in-line pressure gauge and a high-pressure valve that fits tightly to avoid air loss. The pump can inflate up to 29 PSI. Inflating the Venice took me five and a half minutes, without counting the time it took me to catch my breath (note to self: next time bring the electric SUP pump). NIXY recommends 15-20 PSI. 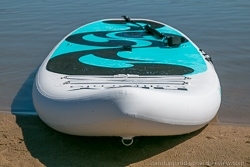 In those five minutes, I inflated the Venice up to 15 PSI; but I have no doubt that the Bravo pump could have easily inflated the board up to 20 PSI. When fully inflated, the Venice Yoga board is 34 inches wide. This makes it the perfect yoga board. SUP yoga requires you to shift through various positions on the water—good luck doing this on a narrow board. Any quality yoga board should be at least 33 inches wide to give you enough surface area to do your poses comfortably without losing balance. 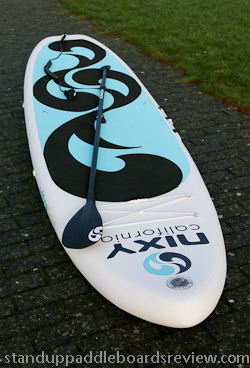 This inflatable SUP board is 10 feet long and 6 inches thick. This is the recommended length for just about any paddler. 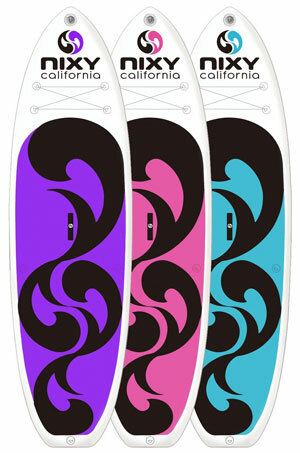 A SUP boarder of any size and level will find this board to be perfect for their needs. It is not too big and neither is it too small. It is easy to balance on, which favors beginners and bigger paddlers and it is not too wide to be restrictive to intermediary SUPers. The NIXY Venice SUP board looks terrific and is available in three colors (white and purple, white and pink, and white and turquoise). The Venice is made with state of the art Fusion Laminated Dropstitch technology and with the best available materials. Not many companies are using this technology as it is quite advanced—probably the future of iSUP manufacturing. The board is, therefore, lightweight, durable and stiff. 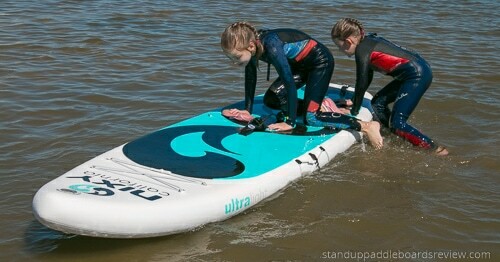 The inflatable paddle board has enhanced stiffness and strength. It can be inflated to 20 PSI, which is higher than virtually all other iSUP boards, making it very rigid, stiff and stable on the water. It can hold up to 400 lbs. It is the ultimate yoga board and ideal for beginners and intermediaries. The Venice has two D-rings for attaching an optional kayak seat (sold separately). 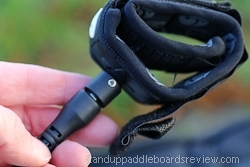 There is also a four D-ring bungee on the front for strapping down a PFD or water bottle, a D-ring on the bottom of the nose (perfect for towing the board), and a D-ring on the tail for attaching the leash. It has two more D-rings on the side, on which you can attach the included padded shoulder straps, which makes the board even easier to carry. Lastly, there is a side bungee to hold your paddle. It has a soft traction pad. Many other iSUPs have traction pads, but this particular board has a soft EVA traction pad explicitly designed for yogis. It is soft, non-slip and lightly brushed to protect your hands and knees. Moreover, this pad covers the entire width and about 75% of the length of the board to ensure you are comfortable in any position. The leash is padded. Since you are supposed to have it tied to your ankle the entire time you are paddling, NIXY Sports figured they should enhance the experience. They sure do make boards that they themselves would like to ride. The fins are tool-less. This means that you don’t require any tools to fix them to the board. Although I mention above that you can use a coin or screwdriver, you can easily do it by hand, as I did. Slide it in and twist. The Venice board is 10 feet tall, 34 inches wide, 6 inches thick and weighs 20lbs. The standard width for a yoga board is 33 inches. This board, therefore, guarantees maximum stability even for new and heavier riders. The general feedback about this board is positive. 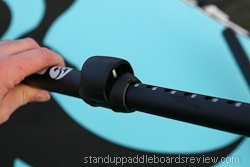 The stability of this board appeals to many paddlers, especially yogis and beginners. The width is just perfect for them. The all-inclusive package is also something that they love. There are no negative reviews on this board. The NIXY Venice Yoga SUP board is fantastic. What’s not to love? It has been designed to cater to all your needs and ensure that you have the best experience. The fact that it is made with the latest technology and they include everything in the box tells you that they were really thinking about paddlers when making this board. My expectations for this board were high, and it has not disappointed. NIXY Sports have been in the industry for some time now; and with this board, they outdid themselves. The bottom line is that the NIXY Venice is the perfect iSUP for any yogi, beginner and intermediary paddler out there. You have got to try it out.